JeepForum.com > Models > Jeep Grand Cherokee & Commander Forums > WK Grand Cherokee & XK Commander Forum > Coil spring options? Since I have everything apart right now and am putting all new front suspension in I decided I should do new coils, insulators and mounts at this time. I had just done Bilstein 4600 struts and shocks a few months ago but didn’t realize how rusty the springs were. I’m not looking to lift or lower it any and was all set to just get some moog coils. There aren’t a lot of other options and I’d rather not spend the money on mopar replacements. I’m mostly interested in ride comfort and keeping height close to stock. A very minor lift that doesn’t sacrifice ride quality would be a consideration I guess. Anyone have a recommendation? If they weren't sagging and just have surface rust, you could clean off the rust and paint them. Transmission: 545RFE w/Sonnax Line Pressure Booster, Transgo Shift Kit, SC Tuner w/SC Adv Trans Tuning App. Wheels: 9X20 front & 10X20 rear SRT Replicas. Future Mods: I am pretty much done, I think?? 06 GCO, Dk Khaki, QDII, Flshing Hi 3rd Bk Lt, MDS "ON" Lt, Airtab Vortex Gens, Debadged, Fumoto Drain Valve, BT Catch Can, Chopped EGR Tube, SRT8 CAI, TruFlow Filter, Sonnax Trans Line Press Booster, SC Tuner W/Adv Trans Tune App, DS and HP tuners, Transgo Shift Kit, ARH Long Tube Hdrs w/3 in Magnaflow/Xlerator AP Exh Sys, Bilsteins, SRT Springs/Sways, Cust Eng Cvr, SRT8 frt/rear bumpers, FRI Sidewinder Cam w/6* advance/6.1 valvetrain, SLP 25% UD Pulley, BBK true 90mm T-Body, SOS Ign Coils w/.060 spark plug gaps, TEA ported/milled heads w/new valve seats, SRT Reps with 265/45&295/40X20's. Also 05 Hemi LX modded exactly like WK and stock 06 300CSRT8. .. how rusty the springs were...Anyone have a recommendation? Steel expands ~19 times when it rusts. That looks like a surface oxidation and is unlikely to affect the spring rate (unless you've really abused them). Factory springs were matched to model/installed options, so ride comfort is probably not going to get any better with 1-size-fits-all replacement. Go with a light baking soda blast and re-coat. '08 WK GC Limited. 5.7L HEMI. Quadra-Trac II. Bright Silver Metallic. Class IV hitch. Michelin LTX M/S tires. Fumoto oil drain valve. Billet Technology oil catch can. I’ve considered it. I believe these to be original springs though with 190k now. Struts, upper and lower control arms, sway bar bushings, links, wheel bearings, axles, inner and outer tie rods and hardware are all brand new on both sides so not planning to take this stuff apart again in the future. I might just go for new mopar units if I can’t find something aftermarket that won’t compromise ride or lift it too much. I think as long as you change the spring isolators out at the same time (which you should anyways) then it should be ok, because the aftermarket rubber isolators should be matched with the round end springs. Many of the Mopar springs are discontinued unfortunately. And they are quite expensive as a rule. Would you consider something in the vicinity of a 2.5" lift? That's quite mild and geometry will be fine. If so, the Old Man Emu springs will work nicely with the Bilstein 4600 series struts. The rear 4600 series shocks will be a bit short though. Thanks for weighing in. I think 2.5” is more than I’m interested in. It’s mostly a pavement driven and winter vehicle for me. Assuming you’re not aware of something closer to stock height maybe within an inch or so? 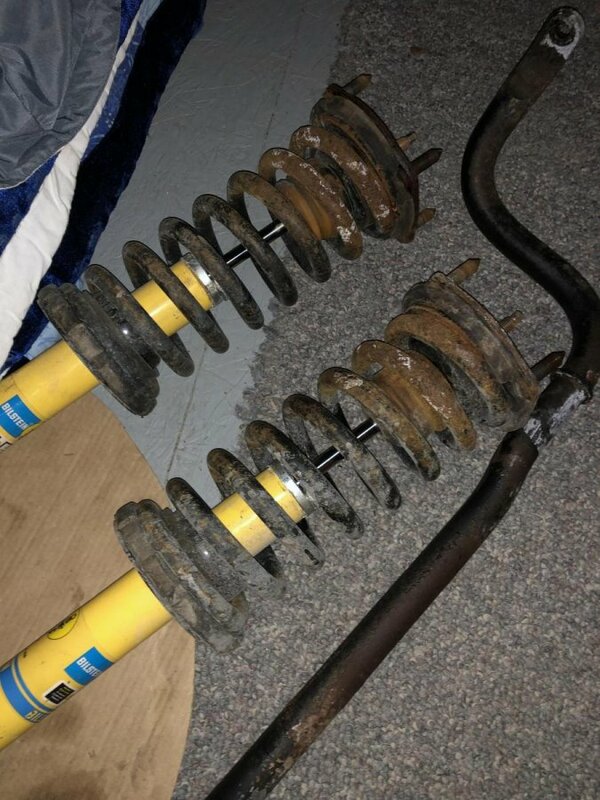 If I went with 2.5, I’d be looking at ome springs front/rear and changing my new rears shocks from 4600 to 5100? What would a cost on all that be? You could keep the 4600's. Other than the MOOG springs, the only other stock height aftermarket springs I'm aware of are the ones made by Delco. I have no feedback as to whether they fit properly however. Send me a PM here on the forum or email me at [email protected] if you'd like to chat about the OME setup. I would think those springs are going to be pretty worn out given their age, I'd suggest replacing the isolators and upper mounts while you're in there so you don't have to take them apart again. I ended up ordering the moog springs, mount and both isolators. I got the springs from Amazon so if they’re not going to sit right with the moog isolators I can return them fairly easily. I didn’t get the rears yet. Assuming the fronts work out, once I get that all back together I’ll probably do a similar refresh on the rear suspension with new springs, sway bushings and links, control arms and maybe the track bar. Find More Posts by Tango. Let us know how the MOOG springs work out. I've been hesitant to recommend/sell them because of problems others have encountered. Perhaps they've addressed the issue. @Kolak , do you have any input on the Moog /or other quick strut complete replacements? I was thinking more for the MK , but any info would be helpful.